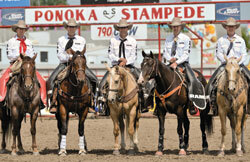 Western Canada is famous for world-calibre pick up men and here are five of the reasons why at the 75th Annual Ponoka Stampede; from left, Jim Kelts, Jeff Resch, Jason Resch, Blake Schlosser and Gary Rempel. After the end of this year, you’ll never see an image like this again as Blake Schlosser has decided to retire from the arena. Not only is he a superb pick up man, but the rancher and working cowboy is a truly phenomenal roper and a wizard with a bullwhip. This issue is all about the horse; expert advice on how to care for them, advice on how to use a good horse to make your training easier and safer and plenty of articles about folks whose time on good (and sometimes bad) horses that helped mold them into the great hands they are today. Trainer and clinician Pat Hooks is back with a terrific photo essay plus some good tips on using a snubbing horse to start a colt. One piece of advice he gives is to ensure your snubbing horse is, as he describes, “an old man’s horse”?—?well trained and working completely off voice and leg cues. The Clemens’ of Beaver Creek Ranch have built their outfit around the horse; competing in both English and Western disciplines, raising some top horses and now they are utilizing the amazing creatures in teaching exercises and team building games. Of course, it goes without saying that being situated in the stunning Qu’Appelle Valley of Saskatchewan just might make their outfit a horse’s paradise. Every magazine editor’s “wampum” is not only who they know, but their mental list of folks and story ideas. No more is it true than with my “list” of Living Legends and right up there is renowned working cowboy and craftsman, Guy Murphy. 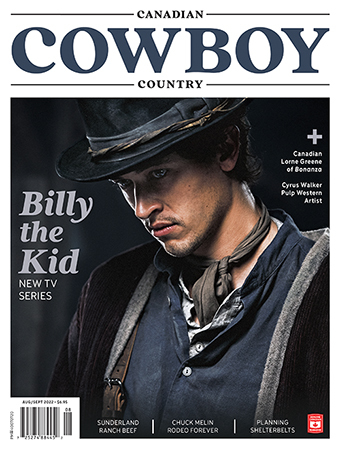 His life began as a cowboy and then he became a pro hockey player?—?until he realized that he wanted to go back to his idea of living?—?working as a cowboy. The pro equine nutrition expert, Doug Milligan from the University of Alberta crafted two handy articles for all of us that are about to buy hay or wean foals. Doug is well-regarded in these fields (no pun intended) and his advice is solidly based in common sense. To bling it all together (pun intended) our Hot Brands is featuring Trappings & Gear?—?truly a feast for the custom gear aficionados soul. It’s all custom made and every single piece would look stunning on my Super Cowhorse Woody?—?just one of the many great horses here in Canadian Cowboy Country.